Lime Crime is a fairly new brand to me, even though I know it isn't. I just hadn't heard of it until around 6 months ago. Their products are of really high quality and I like them because they are quite quirky. 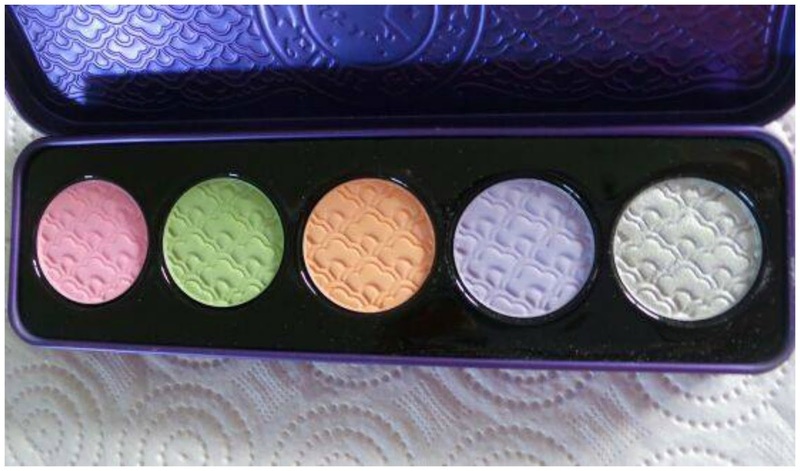 This is the Marie Antoinette inspired eye and cheek palette and it is a really gorgeous, one of my favourites in the Lime Crime range. Amazing to play about with, mixing and matching the different shades. 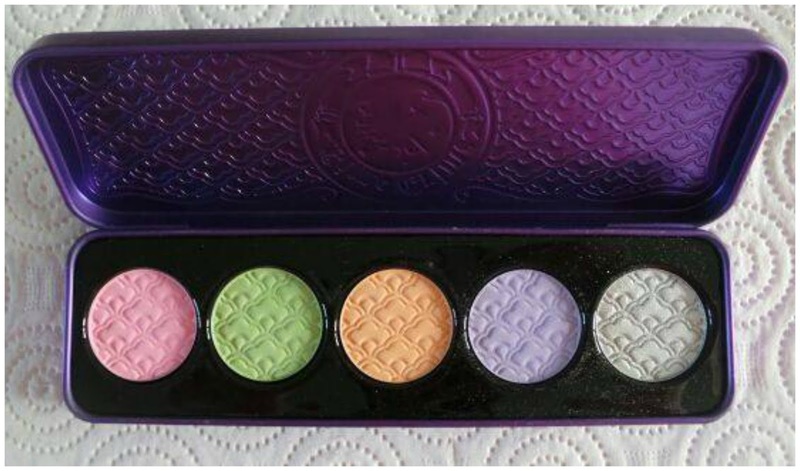 The palette comes encased in the gorgeous Lime Crime purple tin with the signature Unicorn logo embossed on the front. Securely packaged - I'd say if you dropped this by accident, the shadows would survive, which I find really important, being as clumsy as I am. Inside contains 5 beautiful pastel shades 'reminiscent of royal confectionery delights'. Four Matte Shades and one Metallic. This is an adorable baby pink, which is lovely to wear on it's own or blended with another colour, depending on the occasion. It is also really pretty to add a hint of colour to your cheeks. Probably my least favourite shade in the palette, I think it just comes down to personal taste, this is quite a lime green and I would prefer a 'forrest green' if I had to choose. This adorable peach is really pretty for Autumn when mixed in with your favourite brown/mauve shades, very subtle - but could be built up to your preference. 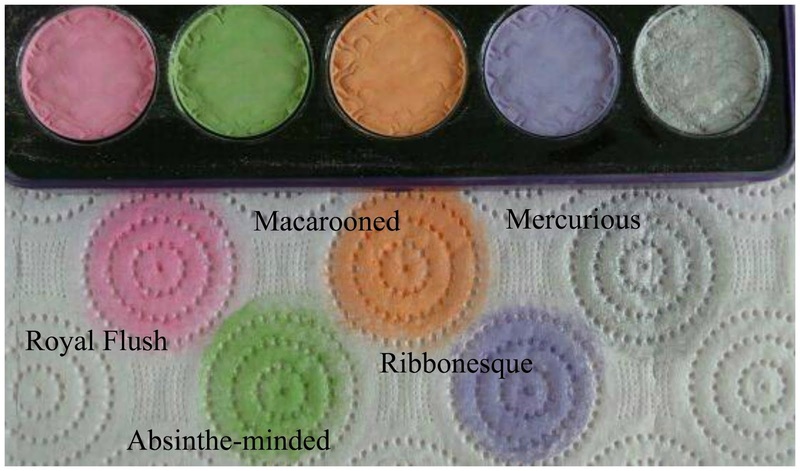 Ribbonesque and Mercurious are my favourite shades in this palette. Ribbonesque being a beautiful lavender and Mercurious a metalic silver with the tiniest hint of sparkle - these are great on their own but actually compliment each other very well, when worn together. Each of these shades are really pigmented and have a real velvety texture. This isn't a new palette but Lime Crime really spoilt us with this one. You get good wear out of these shadows - I would say 3 or 4 hours before they start to fade, you will obviously get longer if you prime your lids beforehand, thus getting the most out of your product. This palette is available to by from the official UK Stockist - Cocktail Cosmetics for £23.95. Love this pallet although I agree, not too sure about the green. But I suppose mixed with some grey & blacks it might make an interesting smoky eye look? Looks really nice. Would love to see a tutorial. Hey lovely, i'll see what I can do. This looks like a beautiful palette!